There are 64 Assisted Living Facilities in the Reston area, with 4 in Reston and 60 nearby. The average cost of assisted living in Reston is $5,491 per month. This is higher than the national median of $3,346. Cheaper nearby regions include Herndon with an average starting cost of $5,295. To help you with your search, browse the 302 reviews below for assisted living facilities in Reston. On average, consumers rate assisted living in Reston 4.0 out of 5 stars. Better rated regions include Herndon with an average rating of 4.3 out of 5 stars. Caring.com has helped thousands of families find high-quality senior care. To speak with one of our Family Advisors about assisted living options and costs in Reston, call (855) 863-8283. Situated 20 miles northeast of Washington, D.C., Reston, Virginia, is a census-designated place with over 1,350 acres of open space. Reston was named one of Money Magazine's Best Places to Live in Virginia in 2017 because of its many golf courses, lakes and nature trails as well as the plethora of dining and shopping opportunities that offer seniors outdoor recreational opportunities and culture. Seniors in the area seeking assisted living should note that the Virginia Department of Social Services regulates assisted living facilities (ALF) throughout Reston. There are 62 ALFs in the greater Reston area, with four directly within the town and 58 in neighboring areas. ALFs are not considered nursing homes, as the primary purpose of an ALF, according to the state of Virginia, is to provide personal care services, 24-hour supervision and assistance for four or more adults. Reston has an array of community resources for seniors, including the Reston Association, an organization that provides seniors with various trips, tours and events to enhance the well-being of citizens aged 55 and up. In Reston as well as the rest of the state of Virginia, Social Security retirement benefits are not taxed. In addition, pension income and retirement account withdrawals are deductible up to $12,000 for seniors, allowing more to be spent on assisted living costs. Public transportation is provided by the Reston Internal Bus System's five circulating routes throughout the town. For seniors looking to travel outside of the area, the Washington Metro provides half-price transportation to Washington, D.C.
Because Reston's air quality is considered 13 percent worse than the average air quality across the nation, seniors who enjoy spending time outside might find their respiratory illnesses aggravated. The cost of living in Reston is nearly 40 points more expensive than the average cost of living in Virginia. Though average utility and health costs are cheaper in Reston than throughout the state, housing costs are 105 points higher in Reston than in Pennsylvania. The Reston area is home to world-class medical facilities, including Reston Hospital Center, in the event of medical emergencies or illness. Assisted Living costs in Reston start around $5,491 per month on average, while the nationwide average cost of assisted living is $4,000 per month, according to the latest figures from Genworth’s Cost of Care Survey. It’s important to note that assisted living rates in Reston and the surrounding suburbs can vary widely based on factors such as location, the level of care needed, apartment size and the types of amenities offered at each community. 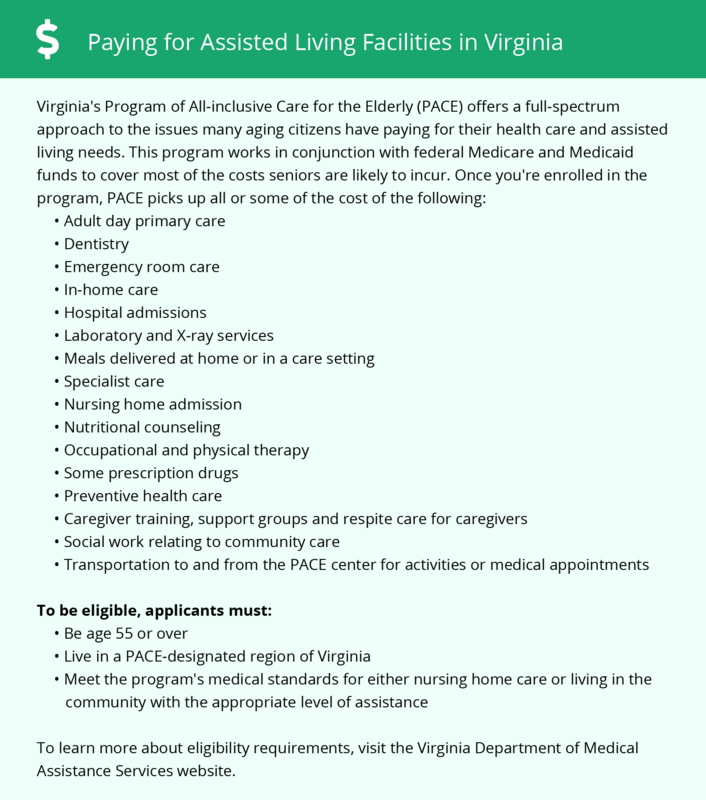 In Reston and throughout the state of Virginia, qualifying seniors can apply to receive financial assistance for assisted living through an Auxiliary Grant. This program is an income supplement offered to individuals residing in an ALF that provides a cash grant to help pay for assisted living fees. Reston and the surrounding area are home to numerous government agencies and non-profit organizations offering help for seniors searching for or currently residing in an assisted living community. These organizations can also provide assistance in a number of other eldercare services such as geriatric care management, elder law advice, estate planning, finding home care and health and wellness programs. To see a list of free assisted living resources in Reston, please visit our Assisted Living in Virginia page. Reston-area assisted living communities must adhere to the comprehensive set of state laws and regulations that all assisted living communities in Virginia are required to follow. Visit our Assisted Living in Virginia page for more information about these laws.